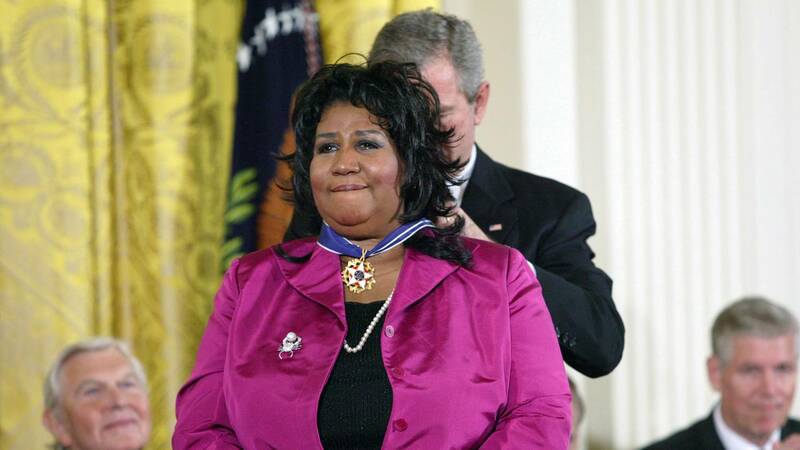 President George W. Bush presents the Presidential Medal of Freedom to Aretha Franklin on Nov. 9, 2005. WASHINGTON (CNN) - Aretha Franklin, who died on Thursday, was beloved and admired by many, including presidents. The legendary soul singer met with, performed for and was honored by many of the presidents during her long career. Here's a look back at some of Franklin's most memorable moments in Washington. In 1977, Franklin performed at the inaugural gala for President Jimmy Carter. But that wouldn't be her only time celebrating a president's victory. Years later, she performed "I Dreamed a Dream" at President Bill Clinton's inauguration. One of her more notable inauguration performances, however, came in 2009 when she performed "My Country, 'Tis of Thee" at the inauguration ceremony for President Barack Obama. Franklin performed at the annual Kennedy Center Honors Awards a handful of times. But she was formally honored in 1994. More than a decade later, in 2015, she made guests --- including honoree Carole King and the Obamas --- emotional after she performed "(You Make Me Feel Like) a Natural Woman" at the ceremony. The performance elicited a standing ovation. To date, a clip of it has been viewed on YouTube over 12 million times. On Nov. 9, 2005, former President George W. Bush presented the Presidential Medal of Freedom --- the nation's highest civilian award --- to Franklin. The announcer during the ceremony described her as someone who "revolutionized American music." She was honored for "her lifetime of achieving and for helping to shape our nation's artistic and cultural heritage," the ceremony's announcer said before Bush presented her with the award. Franklin teared up as the medal was placed around her neck. In 2013, Franklin was among the star-studded lineup of performers --- including The Avett Brothers, Mariah Carey and Janelle Monáe --- at the National Christmas Tree Lighting. Franklin was awarded an honorary doctorate at Harvard University's commencement in May of 2014. There, she crossed paths with former President George H.W. Bush, who congratulated her onstage. In 2015, she sang "America, The Beautiful" during a send-off ceremony for then-Attorney General Eric Holder. Before performing, she and Obama fist-bumped on stage. Franklin also interacted with President Donald Trump before he was president. The singer and Trump were pictured together at the grand opening of the Trump International Hotel and Tower on May 19, 1997 in New York City.